During this unique stamping workshop you will spend some creative time designing and crafting copper art that you can cherish forever. 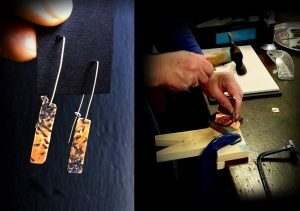 Belper Jewellery Designer Zoë Adamson, will guide you as you learn about a metal artists design processes before making your own bespoke pieces from start to finish. Price includes all equipment and materials needed to make 2-3 items; articles such as earrings, pendants, rings, keyrings, decorations, fridge magnets…… The photos are of pieces of jewellery made on previous workshops at Creartii. Also please feel free to bring along any broken or unused jewellery if you have any, as we can incorporate these into designs.